WA Patriot employees participated in two Permission to Start Dreaming Foundation events in September: The Race For A Soldier 5k and Half Marathon and the Pull For A Soldier annual events. Mac Stanton, Mikhail Balasyuk, Jeff Elseth and Larry Oathout were excited to show off their skills at the 2nd Annual Pull For A Soldier trap shoot tournament, which was hosted on September 8, 2017 at the Gig Harbor Sportsmen’s Club. 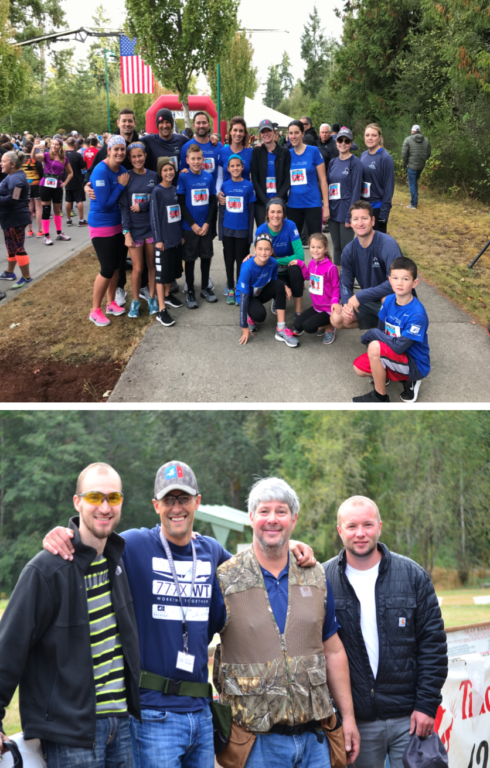 Kyle Sturrock, Mac Stanton, Mickey Traugutt, Kari Beck, Kayla Fillion and Zerah Florance all ran in either the Race For A Soldier 5K or the Half Marathon that took place September 24, 2017 in Gig Harbor. We would like to congratulate those team members and their families who ran in the marathons, and we thank the WA Patriot volunteers who organized cone and signage placement along the race route. For photos and additional information on these events, please visit their respective webpages www.pullforasoldier.org and www.raceforasoldier.org.